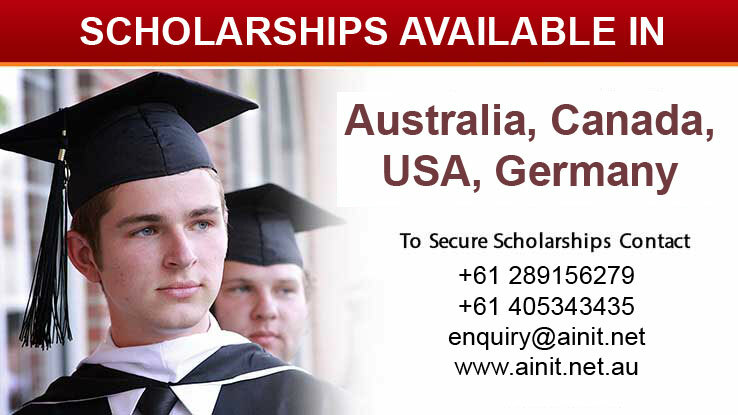 At AINiT we understand and value the need of scholarships for international students and other funding options required by students while applying to study abroad. Hence, we take pride in professionally assisting our clients in achieving the most suitable scholarships for them through an extensive range of international scholarship programs. For this purpose we have collaborated with various international universities and institutions in Australia, US, Canada, UK, Germany and China. The Endeavour Post Graduate Scholarship Program offers financial support to international students who seek to pursue their Masters or PhD Degrees in Australia. This program aims to promote knowledge and education by extending valuable fundings for international students. For the purpose of facilitating international students with funding options for their studies in Australia, La Trobe Academic Excellence Scholarship is offered to academically high performing students in undergraduate or postgraduate programs at La Trobe University. This program is being offered to students who wish to pursue their Masters by Research degree or PhD at Flinders University, Australia in order to provide international students with an opportunity for experiential learning with qualified Australian Researchers. The Fulbright Foreign Student Program in USA enables international students to study in USA Universities and Academic Institutions by facilitating them with financial scholarships to cover their tuition fee, airfare, health insurance and living stipends throughout the duration of the study program. This program for international students are offered to those who have outstanding academic credentials and wish to study in a postgraduate program in UK universities. The Vanier Canada Graduate Scholarship program is exclusively designed to provide funding facility for international students who are enrolled in a Doctoral degree program in Canada. These are offered to professionals of developing countries who wish to pursue their postgraduate degree in German Universities. The ERASMUS+ Program offers a range of funding opportunities for international students from all around the world who wish to study Bachelors, Masters or Doctoral programs in German Universities and Institutions. This program is offered by China Scholarship Council and are specifically designed for Pakistani or other international students who are pursuing their PhD in China. These are awarded to Pakistani and other international students in order to facilitate their studies in China at undergraduate and postgraduate level. Our team at AINiT has in depth knowledge about scholarships being offered all around the world for international students. Apart from these programs mentioned above we can assist you with numerous other programs according to your eligibility. For further details contact us.